7.88 points at 24 votes (rank 109). 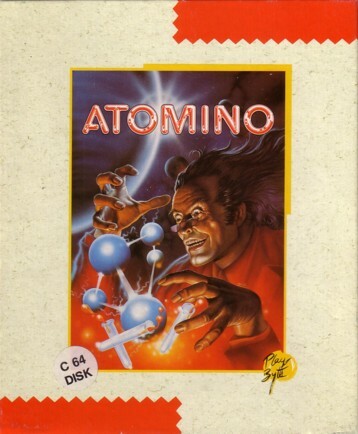 In Atomino you have to arrange atoms with each one to four free connections in a way so that stable molecules are created. The atoms fall with rising speed one after the other into a shaft, that offers space for 6 atoms, whereby the current atoms is always lowest. From there the atoms need to be placed on the game area. You can place altogether 56 atoms (7x8) there. If atoms with free connections lie next to each other they connect and as soon as a molecule without any free connections has been created, it is automatically removed from the game area. If the shaft for the atoms is more than full, the game is over. The computer each gives a task (level). In theses levels there are only points for molecules that correspond to the task. There are three different types of tasks. Build a number of x molecules with at least y atoms. 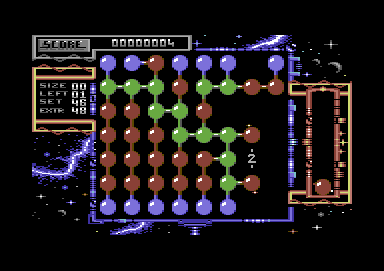 Here you need to put together a certain number of molecules (LEFT) with a given minimum size (SIZE), whereby at the beginning of the game the addition "with at least y atoms" is left out. Here the molecule needs to correspond to a given structure. Here already some atoms are on the game area. They are screwed together and cannot be swapped. Here the task is to reach as many points as possible. There are points for each placed atom and each molecule without any specifications about how the molecule is supposed to look. You only play against time. In both modes there is the so-called "Extra round". It is enabled by a molecule that contains at least as many atoms as given in the display next to EXTR. 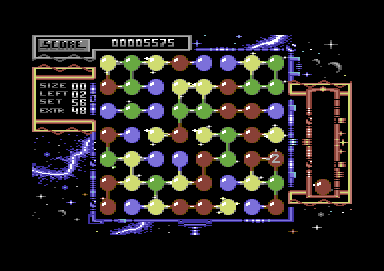 In the Extra round the whole game area is filled with atoms and the player needs to sort them around (without time limit) so that a big molecule without any free connections is created. Es soon as a molecule has been created new atoms start to fall into the shaft again, therefore you should be careful while rearranging not to create a small molecule as the rest of te atoms will then be staying on the screen. The graphics are appealing and the choice of colour was well done. The displays are aligned cleary and are good to read. At every new start of the game the options menu is shown in which you can simply set next to the game mode also sound and graphic options. 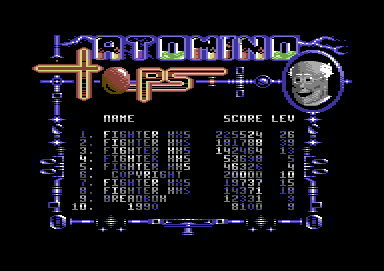 The controls are easy to graps and the highscore list is saved. 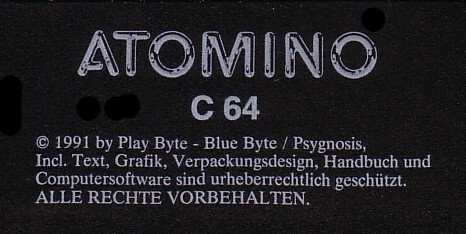 The cursor is moved with the joystick, with fire the choices are confirmed or respectively the atom is placed. In mode A there are X^2 points for each molecule that fits the task ( X=number of atoms). This score is if required multiplied with the number of "fixed atoms". Additionally there are also bonus points for each finished level. In mode B there are 10 points for each placed atom plus the squared number of atoms for each complete molecule. In the extra round there are 2x56^2 = 6272 points for a complete solution in one molecule. To reach a score as high as possible you should try especially at the beginning to form huge molecules to then reach the extra round. For this you should place the blue "ones" systematically at the border and connect to red "twos". In the later course of the game there are then many yellow "fours" which should be placed as much in the middle as possible. When the game area is very full you should store the fours and threes somewhere to first make some space with the ones and twos. This is especially important after a prematurely ended bonus round. After entering the password you start the game in a higher level. 60 KISS FLIP does not work! Entering "FIESELPIEF" in the start screen activates a level skip with RETURN. 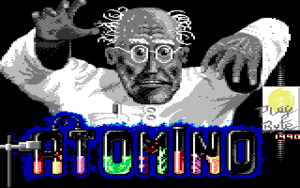 The version by Remember offers next to the manual and a highscore list that is saved also the following cheat modes: passwords, container for atoms does not get full, appearing atom types by press of a key, jump level. FXXS: "Easy to learn logical game which motivates by the good score system and the great music to do a highscore chase. 10 points." H.T.W: "The task is very simple: connect atoms to a molecule. First difficulty: No connection of an atom must be free. Second difficulty: Partially the molecules need to have a given appearance or be put together from a certain number of atoms. Third difficulty: the time and space are limited. Conclusion: an utterly interesting puzzle game with good background sound. (highly addictive)". TheRyk: "The principle might be simple, but mastering the game, especially the higher levels, is challenging enough. Overall professionally done, good-looking brain game. And while your brain starts smoking and the clock is ticking, you listen to quite good music. Very playable, 7 points." This page was last modified on 28 November 2014, at 01:01. This page has been accessed 5,993 times.